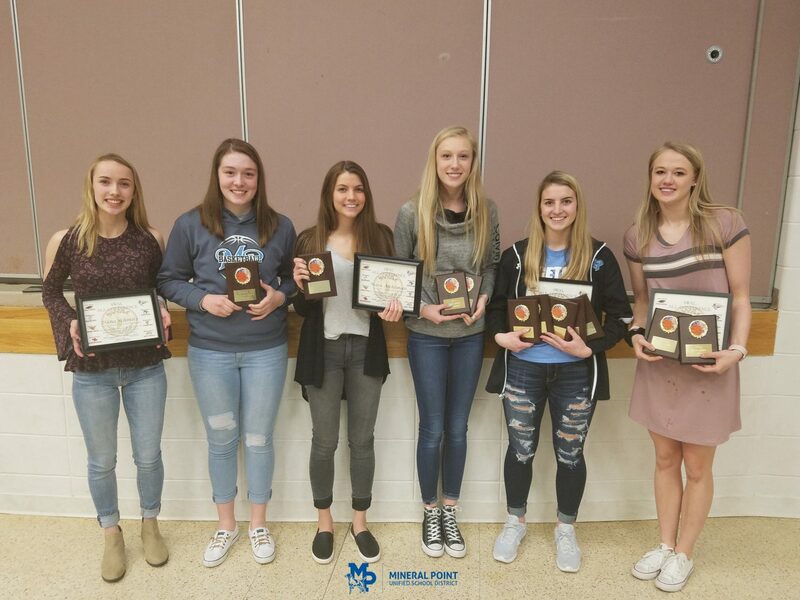 The Mineral Point Girls Basketball Team held its awards banquet Sunday, March 18. Dana Schmitz: SWAL Conference Honorable Mention. Morgan James: Best Free Throw Percentage. Mara Aschliman: Captain, SWAL Conference Honorable Mention. Nicole Johnson: Team Most Improved, Most Rebounds. McKenna Reichling: Captain, Team Most Dedicated, Most Assists, Most Steals, Best Free Throw Percentage, SWAL Conference First Team. Malorie Johnson: Captain, Team MVP, SWAL Conference First Team. The 2018-19 Captains were also announced and will be Mara Aschliman, Morgan James, Kyla Lindsey, and McKenna Reichling. Seniors Malorie Johnson, Amanda Murphy, and Peyton Ross were thanked for their contributions over the last four years. The varsity team finished 3rd in the SWAL Conference with an 11-3 league record and 17-7 overall. The varsity reserve and junior varsity teams were also recognized for fine seasons.